Understanding Long Term Drought - and What to do About it..
dedicated to Australian and all lands dying of drought.. The Sacred Principles of Symmetry to Restore "Wet-Making" Power to Your Land. Wave Patterns (like "Fractals') that INVITE COMPRESSION - CREATE 'SPACE"
To Do That You Add Magnetic Pattern In Order To Teach Waves - PERMISSION TO TOUCH. Then The Water Vapour Molecules in The Clouds Have The Pattern of Charge They Need To Be Steered into SHARING SPACE (TOUCH) Called: MAKING A DROPLET (RAIN!!). This is the Physical Science of Precipitation. Summary of the Electrical Principles of Rainmaking (for scientists)- Richard- this is for you! a) the Immoto and Schweitzer and Sensitive Crystallization water picture..
2. The difficulty the water molecule faces when asked to assemble itself into a DROPLET which will then precipitate and fall as rain, is discovering how to arrange enough CHARGE SYMMETRY to become bonded, embedded and FOLDED INTO A (wave) ENVELOPE. Providing ambient electrical fields which steer charge into this 'dimpling recursion' / 'turning inside out ness' (see animations ) is the electrical solution to rain making. 4. Providing the symmetry seed of charge aligned into a dimple, MAKING A TORNADO OUT OF MAGNETISM.. is what happens when highly paramagnetic biologic materials like cloud seeds, or paramagnetic dolmen are used to fabricate microclimate. 5. Mapping and then bending local bioregion long wave magnetic lines into these dimpling arrays, which produce 'centering force' / the tornado magnetic ultimately can be continent wide. 6. Things like metal structures, fractionated magnetic lines, and electrosmog magnetic pollution, and mono-culture, and lack of human bliss, prevent rain by preventing 'harmonic inclusiveness' (fractal ability to compress implosively in a self organizing way). Compare with how harmonic inclusiveness predicts viability medically in Heart Rate Viability - apply this to ALL biological oscillators - including harmonic inclusiveness (identical with non-destructive compression) IN THE LAND'S MAGNETISM. + Hopi aphorism: JUDGE A CULTURE BY THEIR ABILITY TO ATTRACT RAIN. 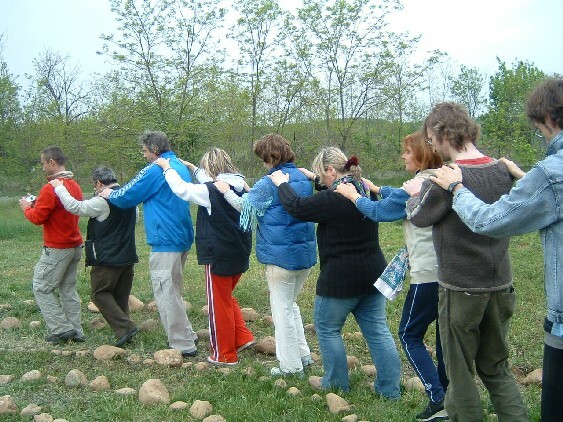 + Marty Cain (labryrinth installer) takes a small core of emotionally energized women to a magnetically crux spot in Vukovar, Yogoslovia shortly after the bombing war there measureably caused all the underground water to shrink back from the land surface. She installs a properly dowsed labyrinth - promotes intense healing dialog with the elemental forces - and the underground water re-appears blossoming underland just like a flower following magnetism. The labyrinthine turning inside out - as a projection of the spiral moebius 7 color donut map - onto flatland..
and CAN teach the magnetism on your land to dimple - and SORT and attract precipitation. JUNE 06- New Images from Geomantic- Magnetic Columnation ('Rain Making'): SYMMETRY PRECIPITATES.. TEACHING THE WATER VAPOR HOW TO TOUCH IN TO A DROPLET..
Just above>note 7 point star /embedding 5 point star: Ophanim Sigil of Truth (Anu/heart Symmetry)..
Again - now in farmland outside Turin, Italy - see Ophanic / 7/5 Sigil (like the Cherokee as well).. in both cases Eagles and Rain came..
the Italian group installed a giant SRI YANTRA in paramagnetic stone..like Bill Witherspoon pic this page.. it was POWERFUL..
<This is the pattern - see the reason it is powerful here (hint wrap to DNA)..
Also compare to the giant geomantic Sri Yantra from Bill Witherspoon in Oregon below -see his description of the weather and environment effect..
first.. more pics of the Italian ./ Turin conference.. here dowsing for proper embedding on the land magnetic ley cross for the LABYRINTH heart..
Below> thanks to Chiara: drawings of the beings seen claivoyantly as the sky opened over the final (Ophanim) ritual..
4. Confirm that arrays of paramagnetic stone (granite / basalt / lime) - create measureable microgravity changes - particularly when arranged like 1)Ophanim Sigil (7/5 Anu/Hydrogen/Heart Slipknot - as used by Cherokee) , or 2) SRI YANTRA (above and below), or 3) 10 spiral pine cone- top down view of DNA (in addition to creating measureable seed germination improvement - goldenmean.info/germination - and improved electrically successful human death - goldenmean.info/death ). 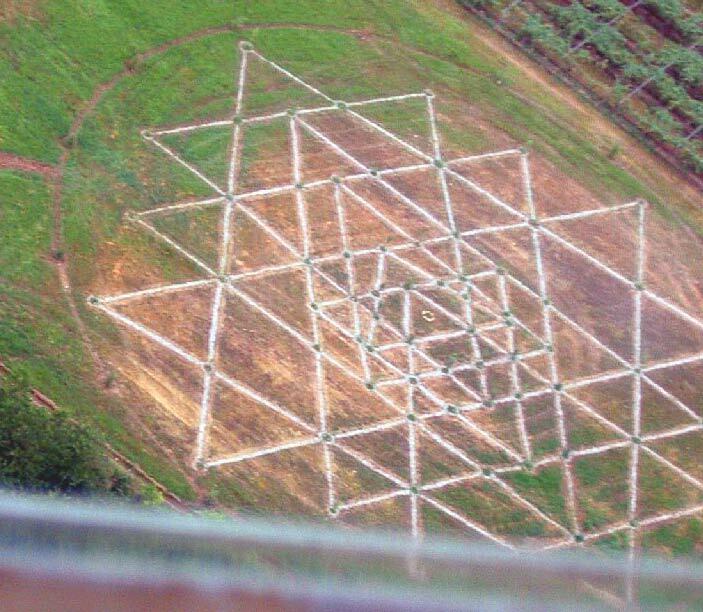 Bill Witherspoon's Sri Yantra in the Desert Modifies Fertility, Climate..... and Gravity?? -also see the parallel anthropological evidence- lack of permission to touch / lack of contact permissive symmetry in cultural laws CREATES DESERTS:DESERTIFICATION, Patriarchy and "Hard-Making Power"-Politics that Prevent Touch - Prevent RAIN! Self organization from the projective geometry of CHARGE = emergence = immanence = flow of similitude. More on HOW the Sri Yantra = the charge shadow of 9 concentric THREE DIMENSIONAL Golden Ratio tetra forms the slip knot for the heart, hydrogen, & Sun - at goldenmean.info/sriyantra - 3D Sri Yantra of Embedded Golden Triangles holds Slip Knot Seed for perfect Anu/Heart/Sun Coeur? 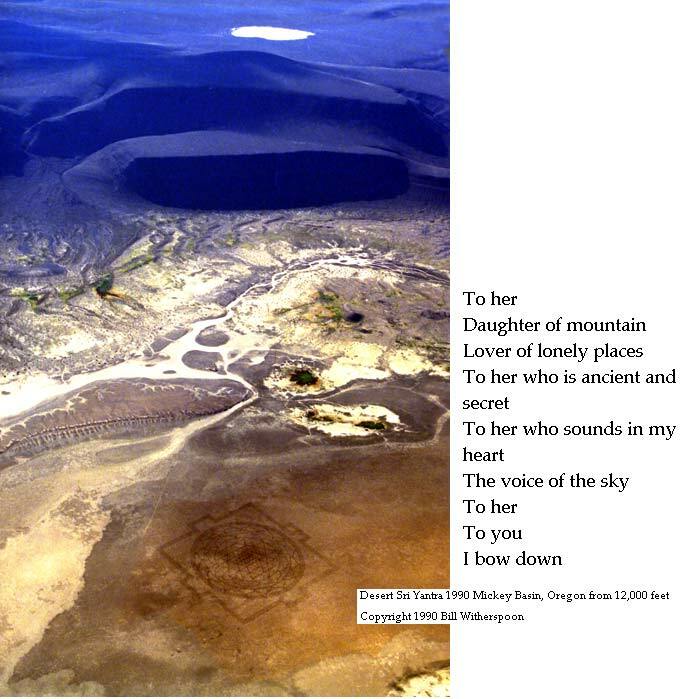 In the summer of 1990, a group of friends, one of my sons and I went to a remote alkali lake bed in the high desert of southeast Oregon to inscribe a large Sri Yantra in the earth. It was to contain a central point large enough to live in. The site was chosen because of its beauty and remoteness. Almost no one, except a few ranchers, ever went there. Inscribing lines in the alkali surface would not disturb any vegetation and it would be a transitory event, eventually disappearing back into the surface through the natural action of wind and the occasional water that floods the lake bed every few years. The design was made without machines or modern tools except binoculars and a simple hand plow. We used only ancient principles of geometry and long wires and sharpened poles as tools. When completed it was 1/4 mile across, covered over forty acres and contained over thirteen miles of lines. The lines, plowed with an old fashioned garden cultivator pulled by three crew members and steered by the fourth, were about four inches deep with the hard alkali crusted dirt cast to both sides of the furrow. During construction, we were careful to minimize the disturbances to the land. We chose to walk several miles daily from camp to the site rather than use vehicles, and refrained from using other motorized devices such as a tiller. We did not want to leave tracks or other marks, not to preserve anonymity but out of respect for the purity of the process. Construction of the Sri Yantra took ten days to complete. As soon as the last line of the design was plowed, heavy clouds began to collect in the south. Within an hour, our valley was filled with high winds, intense lightning strikes and about 1/2 inch of rain. The result of this storm was that all traces and tracks from our working were dissolved. Like a finished painting, it was as if the surface had been varnished. Remarkably, the lightning and the rain were limited only to the small valley where we were working, a fact that was the source of much speculation by a nearby rancher who wanted the rain on his land. In the three weeks that followed, I lived in the nine-foot central circle of the Sri Yantra. During that period and on several occasions during the following years, other people and I observed remarkable changes in the workings of Nature within the design and in the valley where it was situated. One of the more interesting subjective changes was a modification of the "feeling" within the valley. While a difficult parameter to describe or measure, this change in feeling was noted by ranchers and other people who have known the area for a long time. People reported experiencing qualities of energetic peacefulness, harmony with nature and enhanced intuition when they were in the design and valley. Another influence was a radical change in the quality of meditation that would repeatedly occur if individuals moved a few feet out of the central circle into the innermost triangle of the design or vice versa. Changes in the environment were also observed. Within the design, which had been inscribed in highly alkaline silt, incapable of supporting any kind of vegetation, there were remarkable changes in the direction of increased fertility. Two years after construction, even though the lines were disappearing, the structure of the soil had changed from a highly compacted mixture of silt and salts to a loose, crumbly soil that smelled and tasted more like normal soil. The surface of the soil was also significantly changed. Instead of the flat, layered and often cracked surface that had characterized the lake bed before inscribing the Sri Yantra, the surface became "rumpled;" formed into a three dimensional configuration of regular ridges and valleys that arranged themselves in the pattern of hexagonal close packing, much like an egg carton. The pattern was caused by modification of the surface soil into a physically expanded, more adhesive and resilient material. Both of the soil changes were due to an extraordinary proliferation of soil microorganisms and the resulting increase in soil organic matter. The soil changes were limited to the forty or so acres of the design and were most pronounced in its center. In other respects, the entire fifty square mile valley was different. The ranchers noticed a continued increase in the valley's rainfall. This was accompanied by increased vegetative growth, as well as increased populations of several plants and three animals species that were not previously common in the valley. Because of these observations, I began to speculate about possible mechanisms by which the geometric structures might bring about change. The most interesting observation was that there appeared to be an inverse correlation between the gradual disappearance of the design as it melted back into the lakebed and the increase in the presence or influence of the enlivened laws of Nature. Other analogous situations seem to exist as in Homeopathy, where increasing levels of dilution are said to represent or impart increasing levels of strength. An even more striking parallel may exist with the principal of Sangyama. Sangyama, as described by the Indian Rishi, Patanjali, is a process in which the mind generates an impulse at the deepest level of consciousness and then allows that impulse to settle back into the field of pure undifferentiated consciousness from which it had been drawn. The result of this process is the appearance of a new impulse that has enormous power and direct support of fundamental forces of Nature. The construction of the Sri Yantra was also accompanied by other events that gave rise to new understandings about how Nature might operate. Going into the valley for the first time, I was driving the converted bus and towing a pickup truck. We stopped and I got out to open a barbed wire gate. Sitting on the gatepost was an adult golden eagle. The eagle looked at me squarely, swished its tail back and forth several times, dropped a tail feather and flew off. In the next several weeks, I had occasion to go through the same gate many times and there was no eagle. Then, on my homeward trip, as I passed through the gate for the last time, a golden eagle was sitting on the same gatepost. It waited for me to get out of the bus, looked at me squarely, swished its tail, dropped another feather and flew off. Back home, several weeks later, the National Guard discovered the Sri Yantra and the media, not knowing its origins or implications, created a greatly exaggerated hoopla. I was in a position of deciding to speak publicly about the project or remain anonymous. In order to clarify the rapidly growing misunderstandings, I decided to speak publicly. Immediately upon making that decision, I walked outside my rural Iowa home and looked up into the sky. Directly above the house were fourteen circling bald eagles. Everywhere that CHARGE radiates, water is soon to follow. The geometry of (capacitive ) charge radiance is the organizer of water - and DEFINER OF ALL LIFE. 1. Reduce Metals in Land Environment (Bleeds Capacitance / Bonds created in man made metals lack harmonic inclusiveness / fractality - the context rich embedding of charge which can focus water vapor).Exception - optional -a bit of gold or palladium at the core of your magnetic rose. 2. Learn basic dowsing / Make a magnetic map. (of tha major magnetic lines thru the property and buildings). If you cannot FEEL magnetism - ultimately you cannot feel. 3. Use paramagnetic stone to 'lens' (bend and focus) the magnetism into fractal (rose) like patterns to attract charge - implosion precipitates rain. (Examples below - labyrinth and stone circle). 4. Align the stone circle and labyrinth construction made of PARAmagnetic materials.. properly 'embedding' them on the ley magnetic lines. 5. Optional - spectrum analyze (harmonic analysis) to note where the weak inductive and capacitive fields are most harmonically inclusive (sacred) - to tune and perfect the magnetic wind harp which is your land. 6. Use materials which hold capacitive fields once charged, to strongly radiate charge density - fabricating the field which will orient local water vapors into droplets. Cloud seeding is actually a primitive form of this. More advanced forms use - a highly charged capacitive chamber to piezoelectrically ring materials like calcite or calcium carbonate, or quartz sand - which them are spread into symmetry on the land to fabricate long wave converging lens like (rose like) structures to cause precipitation. FRACTIONATION OF MAGNETIC LINES IS THE CHIEF CAUSE OF DROUGHT. Learn the simple physics of fractality versus fractionation - AND the psychology. MONO-CULTURE CAUSES DROUGHT BECAUSE HARMONIC INCLUSIVENESS (fractality - which is required for anything to be alive) of CHARGE - IS IDENTICAL WITH THE RADIANCE GENERATED BY GENETIC DIVERSITY. 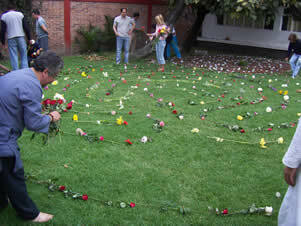 Install extreme genetic diversity around your flower like labyrinth paramagnetic. Learn to talk to the elemental forces. Recognize how the magnetic dreaming lines of ancestors when tangled in the land - need sorting before rain can return. Ancient memories with great inertia must be made shareable / enter compression symmetry - before wetness (permission to touch) can return. new: May 2003- Using spherical capacitor (gold egg below) IS able to measure life force in water: (ability to radiate charge equals ability to radiate the information which organizes biology by orienting the geometry of water crystallization)..
Did this rain break Byron's 'worst drought in 100 years'? To learn the principles of geomancy (magentic grid engineering) for life force.. let us use as an example case -the situation of the average Autralian land owner whose garden or farm is dying from lack of rain. The motivation and intent to restore rain is appropriate and healthy to restoring life in general - because the ability to attract rain is precisely identical with the ability to attract magnetic flux and charge density - which are how the information we call life is communicated. So finding yourself without the flow of water is the same as finding yourself without the flow of life itself - which is to be out of the flow of magnetism and charge. So - how to get - 'back in the flow' is ultimately the same as the question 'to be or not to be'. This article will first then deal briefly with the theory and principle of what attracts magnetism / and charge and therefore water. But then the major thrust of this section will be to provide a practical sequence of steps in outline form, to restoring rain - and life. Water follows magnetism - because the water itself is highly paramagnetic. This means simply that most water contains enough trace elements to be highly piezoelectric - which is responsive to electrical fields. (Piezoelectricity refers to the ability to couple or lock together simple waves of mechanical pressure ('stricture' / or compression) - often 'sonic or phonon' - with an electrical voltage and the current that induces. Piezoelectricity in slinkly type structures like quartz and DNA are natures way of connecting SHORT WAVES WITH LONG WAVES). It is important to begin to get the idea - that to steer water around intelligently in bioregions - you must understand how to steer electro-magnetic fields around with symmetry. This is because the two are directly coupled in their flow. Essentially put - water IS the magnetic blood of Earth. And like the blood in your body, both the magnetism and the water in the Earth have to find symmetry or they die. Symmetry is required because it is the only way inertia can be distributed without destuctive interference. Without symmetry (pretty rose like unpacking patterns) the inertia in the flowing water and magnetism would be canceled out or die. So both water and magnetism follow symmetry to avoid the death of destructive interference. Eventually you will get the idea that water molecules are not stupid- they will not fall into gardens or farms - where there is not enough magnetic symmetry - because they know that would kill them. So we understand now - that we are going to need to restore a certain symmetry of magnetism - to get water back to the land. But how? First we need to understand what KIND of symmetry of magnetic and capacitive charge flow MOST ATTRACT WATER. 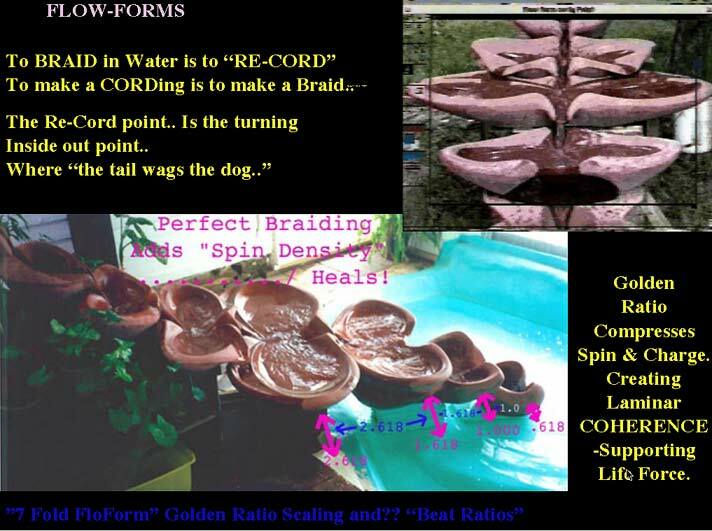 Braiding allows water to cascade into something called COHERENCE. 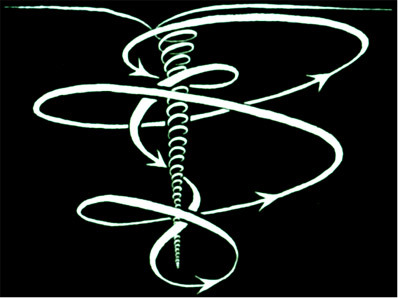 This was the logo for my original article: Braiding DNA, Is Emotion the Weaver? 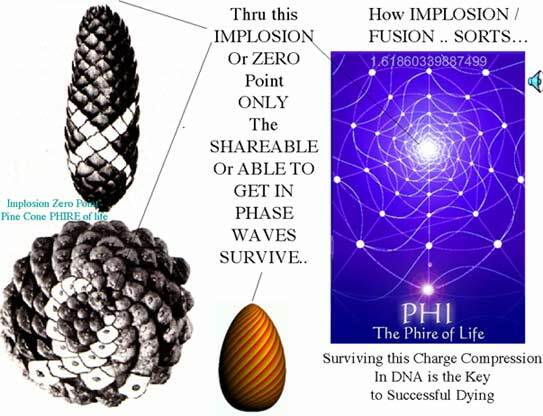 The next step is to understand - that the limit or ultimate completion of the BRAIDING process - is to create IMPLOSION. Implosion happens when your braid begins to turn inside out. Read about the effect on DNA - turning that into a ring.How's The Radiance of Your Magnetic X Today? This allows successful lucid dreaming, psychokinesis, and dying. The ultimate of the braiding process is the moment when the wave learns to eat it's own tail. 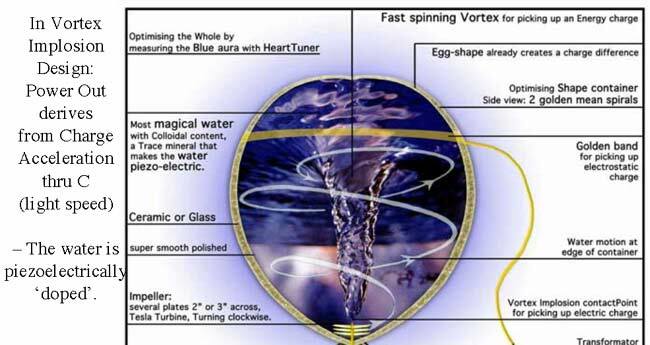 That is how tornados and vortices and implosion becomes self organizing. Read about - HOW TO STEER TORNADOs as the origin of dowsing at: Good Feng Shui When Scientists Cross Ley Lines With Dowsers? WHY is implosion / perfect compression producing FUSION and perfect SORTING - the solution to rainmaking and land healing? Implosion is a symmetry arrangement of waves such that the outer pattern is the same shape is the inner. The best way to visualize this is to consider how the outer folds of a rose mimic the shape of the inner folds. When waves get into this geometry - perfected by Golden Mean ratio - then something called repeated - CONSTRUCTIVE wave interference - allows those waves - to CONSTRUCTIVELY turn COMPRESSION into ACCELERATION! This is the way infinite compression can be non-destructive. Waves when they cross in this rose like pattern ADD and MULTIPLY their wave VELOCITIES as well as their wave lengths. The term for this is called (recursive or repeated self-similar) 'heterodyning'. The point is this becomes an ACCELERATION path thru the speed of light. Once we understand how charge can be accelerated like this, we can understand how electrical circuits can make and harness gravity, because gravity is only a name for the acceleration of charge (which this fractal or rose-like 'self-similarity' permits). Review the following pictures to fuse this idea about implosion visually. 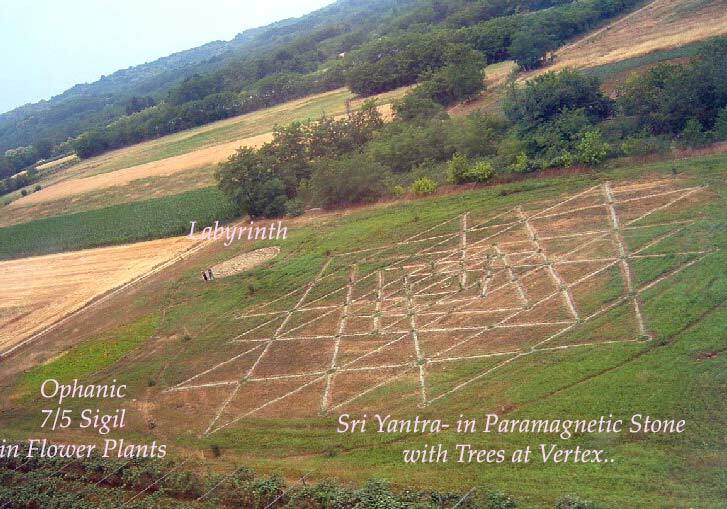 It is important to understand enough about implosion - so that you can begin to visualize WHY assembling magnetic lines into such repeated 'turning inside out' rose like patterns on your land - IS GOING TO ATTRACT RAIN ... ( hint we are soon going to introduce the function of LABYRINTHS to do this ). When waves are invited into a center, where ALL the wave lengths can meet without hurting each other - this is called implosion. It is what creates centering force. This is the burning 'phire' of creation. Now it is necessary that you begin to understand in practical terms - for yourself - exactly why doing this COMPRESSING / IMPLODING / TURNING INSIDE OUT - process - with magnetic lines - WILL ATTRACT RAIN TO YOUR LAND. Have you ever walked up to a really nicely flowing living river, and noticed that either you or your kids - at that moment ARE VERY LIKELY TO WANT TO URINATE (to 'pee'). It is a known fact that if a hospital nurse wants to get the patient to pee.. she loudly runs water in the sink. The simple physics is that the electronic memory in the water molecules in your body, is intensely aware of the need to return to some master unity of flow. This phenomenon that the places you get the urge to pee, are 'cosmically chosen' (like marking the edges of your domain as a dog) -- gives rise to the old saying: "people are water's way of choosing where to move itself". The reason the water in your body - (read the 'Dune' books) is so self aware, is that the molecules in the water have billions of years of memory of the skill to turn inside out / self re-enter. This gives the electrical fields in water the ability to propagate their field effects over large distances. This phenomenon of the skill to spread a self- organizing electrical field over larger and larger distances based on self-referral / self re-entry is called CONSCIOUSNESS. 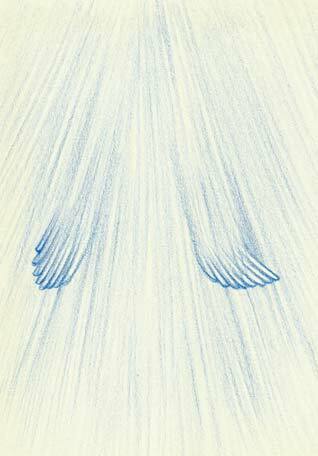 Water that has been allowed to BRAID and nest and spin and absorb CHARGE is highly CONSCIOUS. Water that has been forced to go straight, or stored in metal, or stored under pressure, or experienced too much heat - becomes DEAD. (bleeds capacitive charge - and charge richness/harmonic inclusiveness). Morphic Resonance is based on RESONANCE. 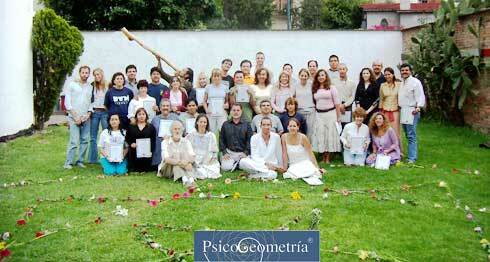 Harmonic analysis of resonance is how we can measure the life force in your water - or in anything alive. Read: HARMONIC INCLUSIVENESS OF CHARGE-Can Life Force Be Measured in Capacitive Terms? Let's tell the story of the life of a water molecule in a cloud - deciding where to rain - as if we were talking to a child. The water molecule is floating gleefully in a white puffy cloud - dancing in the sun. The water molecule stays light and floaty as long as it does not link up with too many other water molecules. Once in a great while scientists make the water molecules become rain by dropping 'seeds' which are little charged mineral crystals into the clouds. Cloud seeds work because they create an electrical field of 'charge' which steers the water molecules like little magnets into the tilt positions necessary to hook the molecules up with their neighbors. The important thing to remember that it is the shape of the field of electrical charge that ultimately steers around the water molecules. The question is - how to make the separated water molecules decide to gather into shared 'wave envelopes' called A WATER DROPLET (hint - this is RAIN!!!). What tempts water molecules to experiment with touching - (making rain drops) - is the SHAPE OF THE FIELD EFFECT OF ELECTRICAL CHARGE - which is steering those molecules around.. This decides if the 'business-end' (the bonding points) of the molecules - can TOUCH - and share space non-destructively. 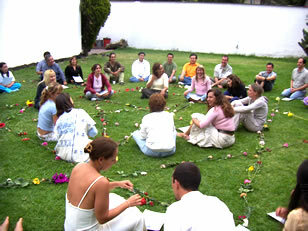 A deep principle is that 'all bonding is phase locking'. This means that waves coming from opposite directions must line up and get exactly into PHASE (like linking heart beats to make love, or linking clock pendulum in a room). This permission to share wave space - is called CRYSTALIZATION - and the experiment in successful sharing which results is the very essence of the principle named 'CHRISTOS'. (Hint: it means total sharing is possible in a completely safe space - eliminating the need or possibility of secrets ... for waves and people). The neat thing about WATER is that the 2 basic kinds of bonds in chemistry are perfectly balanced. These are called IONIC versus CO-VALENT. And for our childs conversation here, consider water's perfect balance between these two types, as the perfect tightrope between short wave - local bonds - versus longer wave - more collective extended bonds. What this means in chemistry - can be expressed very socially: that because of this balance between ionic and co-valent bonds water molecules are exquisitely able to THINK GLOBALLY but ACT LOCALLY! Another thing about water that is helpful to know - for our continuing kids story .. is the ASTROLOGY of CHARGE in water. This means that when waves a charge are gathered in perfect compression into water - the memory of exactly where that charge came from is kept in perfect context. Moving electrically charge (stored in the form scientists call CAPACITANCE) - is the physics of astrology - and does go lots faster than light. So if you grow a water (or quartz) bond nest very slowly - each time a new bond is formed - it makes a harmonic sample stored of the shape of all charge waves coming from every star at the moment of the birth of the bond. (This shows up if you do a musical analysis of each bond like a spark gap nested - 'infinite series'). Take the example - of a quartz crystal grown too quickly in a cooking pot in an electronics lab. That crystal when held in your hand feels like a pate foie goose liver which has been too quickly stuffed. Now you take a similar sized crytal that took many thousand years to grow, and holding it you get pictures inside your head of the shape of all the land around where it grew. This is because the capacitive 'charge' spinning out from each bond - has more harmonic inclusiveness and more memory in bonds that were formed slowly and in context. This explains in part why certain waters that come from very ancient ices are so healing. They are charge dense, information dense, and spin dense - electrically. Now- back to our little molecule (Mr. H 2 You - Owe to Me). Suppose you the molecule were passing over a farm, where they had put in lots of metal fences, metal roofs, metal buildings, and planted huge plots on mono-culture crops. (One seed - no variety). Being a reasonably clever water molecule - you are pretty skilled at not getting yourself killed. In magnetic theory - being KILLED has a very particular meaning. Essentially - to be killed - means to have all your SPIN collapsed into no spin. Remember that spin 'density' is awareness and information density. So for a water molecule - SPIN IS LIFE!!! Why would falling onto a farm with too much metal, and no magnetic long wave pattern, and no genetic diversity (and probably no bliss dancing) - be FATAL for a water molecule??? Because SPIN requires symmetry. The water molecule - speaking at the international conference of water molecules for a better life - election speech was called: GIVE ME SPIN SYMMETRY - OR GIVE ME DEATH!! (Apologies to Patrick Henry here). No scientist would argue that the bond that keeps hydrogen hooked to water requires precise symmetry. Why would not extending that symmetry by critical to get LOTS OF WATER MOLECULES hooked to each other. Remember also - that the only thing which makes water molecules heavier than air enough to fall to your land - is when they HOOK UP into WATER DROPLETS. To bond the little molecules into extended families so they fall on your land - someone has to teach them how to nest! The angle of waves of local CHARGE and MAGNETISM in long wave patterns - is what teaches the water molecules how to SHARE SPACE- and become a droplet. This is called the principle of precipitation - and it is based on how waves nest and become a wave envelope ONLY if short waves nest well (non-destructively) into LONG WAVES! Let us look at some examples of RAIN MAKING historically to better 'grok' these principles. The Orgone rain makers are very successful in a limited way - the problem is that they have not used the correct terms (Capacitance - and harmonic inclusiveness creating compression) - instead they became stuck in un-shareable terminology like ORGONE. But there are some nice things we can learn from them. A classic way for an orgone engineer to make rain is to take pipes made of a white plastic which will columnate or organize microwave and capacitive charge - and place them in a group - stuck one end in a really live river, and the other end pointed at a cloud they want to 'bust' or make rain. The successful physics is easy to understand. The pipe points and directs a 'columnating' or organizing capacitive (charge) field and a microwave field at the cloud. The clouds water molecules are suddenly electrically oriented to more long wave enveloping symmetries by that field, and form droplets. In Trevor Constable's film - "Weather Engineering on the High Seas", he shows that the most successful rainmaking capacitor (they call conic capacitors Orgone accumulators) is a CONE in exactly the 60 degree angle which makes the implosion angle in the dodecahedron nest in the above pictures! Sending waves of capacitive charge into a field producing collapse- makes rain. 1. Understand why most children who spend a lot of time blissful and barefoot - can make a hole in any cloud they choose, by merely focusing on it. 2. 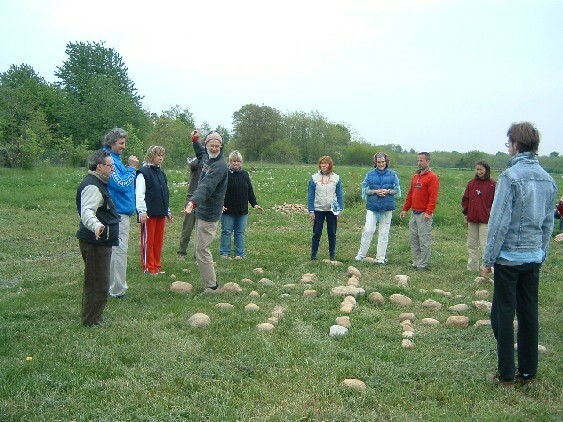 Understand why labyrinth and stone circle making - properly dowsed and embedded on your land - will attract rain. The principle which allows blissful kids to make rain if they focus is the powerful coherence field - both ultraviolet, microwave - and capacitive of human glandular bliss. Cohering an ecosystem magnetic braiding which effects weather patterns the size of continents is everyday work for kundalini - as Tutankhamons priests well knew regulating the timing of the Niles flood - but this is advanced material - (see kundlini link) let us limit this conversation to our childs view of how to bring RAIN to the FARM! Meantime if you ever do have the chance - check for yourself to see if your local clouds respond the moment blissful kids dancing barefoot in mud - decide to hold hands and touch! Another way to ask the drought question is - when was the last time blissful kids touched while dancing barefoot in mud - on your farm? But - let us walk before we run - so we will learn the magnetic hygiene here - necessary to prepare your land for RAIN!! (which just happens to be the same magnetic hygiene necessary to prepare your land for blissful kids dancing barefoot touch permissively in mud). 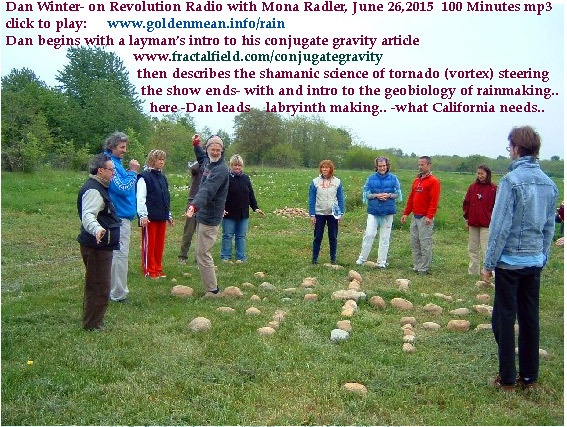 A labyrinth is a way of aligning long wave magnetics to teach them to dimple, and to tornado, and to turn inside out. This takes long magnetic lines - which have gone in a line too long and become PATHOLOGICAL - and teaches them to get spun out in a circle. This permission to touch - creates compression. AND COMPRESSION IS NATURES ULTIMATE WAY OF SORTING OUT EVERYTHING! a.) If you CANNOT feel magnetism then YOU CANNOT FEEL! Clues to your magnetic lines are - where the grass is greener, where trees have forked low, in a row, where stones and paramagnetic structures have made lines in the distance, where natural features - rivers, streams, mountains - have started a pattern of magnetic flow near your land. Once you have the CROSS point of magnetic lines - you probably have a clue to where the underground magnetism and water most likely have their greatest vertical or upwelling dimple. This is called a water ('gnome') dome or djed. You are about to Raise the Djed into your Djed EYE - by drawing the sword of magnetism from your stone. When water takes this blind spring upward underground following magetism - your have the makings for Catherdral - which means - place of leverage on the blood (Catheter) of (Cathartic) magnetism. always produces branches which move ourward in a ODD NUMBER of directions.Water branches underground - like magnetism does- in these ODD numbers, because symmetry lines on a platonic solid always brand in ODD numbers. Water - NEEDS symmetry!! You are learning this because in order to steer water, you need to know what it likes. (a good place to start is near wherever your land is closest to being still wild - if possible - elementals are more likely still alive there). ONCE YOU HAVE MADE YOUR CROSS - LEARN THIS LITTLE PATTERN (think childish delight while you do it).. Learn the simple joy of making a series of walking paths that teach you lands magnetism how to dimple and turn inside out and compress and implode and sort --- AND ATTRACT RAIN!!! The material for your labyrinth should be paramagnetic stones (size variable - material - quartz / granite or limestone base is good - / sandstone /dimagnetic is bad). 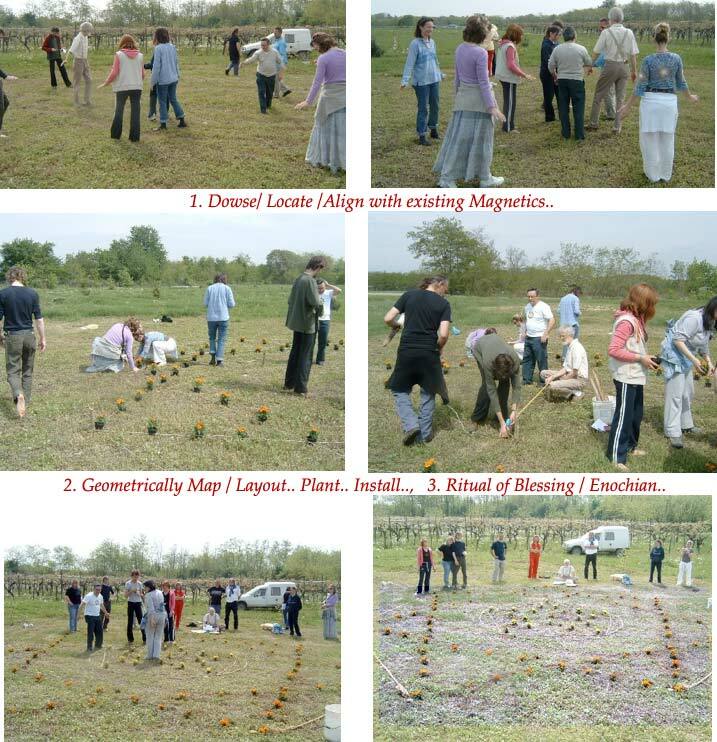 This article cannot be a complete guide to labyrinth building - use the above links - the purpose here is to show you THIS PRACTICE IS EXCELLENT PHYSICS FOR ATTRACTING RAIN. Labyrinths get powerful with added attention - just like babies. The reason that monoculture prevents rain is that fractal implosive compression (sucking in charge) requires harmonic inclusiveness. Harmonic inclusiveness means HOW MANY DIFFERENT WAVE LENGTHS YOU CAN ATTRACT TO ONE PLACE IS THE ULTIMATE PREDICTOR OF VIABILITY!! This means that endless fields of either wheat or sheep are absolutely fatal to attracting rain. Think about it. All our pictures of what makes implosion and therefore ability to attract rain by sucking in charge - require an infinite number of waves - to all learn to meet at one place. (see Phiricais above - ). Such ability to nest all lengths into one - called PHYLOTAXIS - is perfected in Golden Mean ratio. This means that SINCE HARMONIC DIVERSITY IS REQUIRED TO ATTRACT CHARGE AND RAIN- then it follows that GENETIC DIVERSITY IS REQUIRED TO ATTRACT CHARGE AND RAIN!! Bottom line - your rain making land is going to require genetic diversity. Open - pollinated -'heirloom' seeds in diverse gardens are an example. (In other words Monsanto may not have a reason to exist in a culture that values rain). Simple experiment - try planting a large variety of really vibrant flowers between the rocks of your labyrinth walking path. 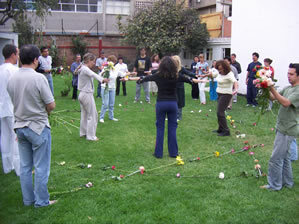 See pics on the labyrinth sites above. REMOVE THE STRUCTURES WHICH MESS WITH MAGNETIC FRACTALITY. This large translates to removing ALL POSSIBLE METAL FROM YOUR LAND. (I know this is a huge task - but you can at least make an experimental beginning and see if your land does not tell you to carry on with the experiment). The Steiner child touches only wood, and stone, and natural fabrics. So should you. Your local water droplets CHOOSING WHOSE LAND TO BLESS - has the same urge! No Sufi dance bliss teacher lets you wear much metal. The reason that heavy metals prevents rain (and life)- is because most metals have an electron valence structure which is the opposite of fractal. Aluminum, -- Steel, -- Iron, -- Copper, -- Silver, -- Palladium, -- Gold. Actually it is the high amperage or temperature artificial environment required to forge most metals which stores pain (lack of fractality / harmonic inclusiveness) in their bond structure. The Autralian habit of using metal so heavily in buildings and roofs and fences - is in my view a very large player in the cause of continental drought! Believe the water in your tank and your house will be capable of a whole lot more life force and ability to attract other water like a sponge - IF YOU GET RID OF THAT SOUL DESTROYING METAL ROOF! The quickest way to kill a magnetic line (and your local elementals)- is to shove something metal into the ground. Think of this next time you un-consciously pound a metal fence post causing the local elemental forces to shudder. Remove the aluminum and all metal you can especially from your kitchen, and bedroom if not house as a whole. The metal coil springs in your mattress and your clock radio's electrosmog prevent not only lucid dreaming, successful dying , but also prevent rain. Next remove all sources of electric current which are not critical to survival. This includes if at all possible turning off the main power breaker each evening. It means religously working to eliminate every device on the land which uses a transformer! (Flourescent lights, mercury vapor lights, etc. are the absolute death of life force and rain making). All devices which use a transformer which you cannot live without - you place that transformer as far from everything alive as you can, and religiously turn it off the minute you do not require it. Consider building a paramagnetic structure (stone or wood / no metal ) building in a sacred (magnetic ) place - especially for blissful and spiritual events. Next : ask yourself IS THERE ANY BLISS PROCESS IN THE LIVES OF THE PEOPLE WHO INHABIT THIS LAND. If not - take action. Learn the science and politics of bliss. Because BLISS ATTRACTS RAIN. Finally -it is a good idea to learn the relationship of the local magnetic lines on your land to the greater Earth grid magnetic wiring. This is like hooking up your local plumbing to the big waterworks of the Earth's magnetic plumbing. The word Adam for example as in 'Adam and Eve' is re-translated as the ability to make hard or to make red. The word Adom in Hebrew does mean red, and referred to the creation of the red-race (iron based oxygen bond in blood). Notice that if we understand properly the pure geometric origin of color in the symmetry tilt of the photon donut as it splashes on to the retinal cone - red is the side of the photon donut which is CONVERGING or CENTRIPEDAL - which means - it makes HARD. (not wet). The word EVE is transliterated conversely as meaning - ability to make WORD or- ABILITY TO MAKE WET. (spelled I-eve- pronounced ye-ve). We now know much better why - the very word for origin of women in our bible (Eve) means to make wet. We might begin by noting that the feminine produced human egg is so very much more fractal or self-similar than the (male produced sperm) seed. So much so that - the first women 'Eve' was traceable by modern geneticist to a particular women in Africa - by looking at the fractal foldedness within the femine cell (in this case - the mitochondria ). A spin path back to information origins is established by the non-destructive compressibility made possible by (the egg's) fractality. Being more fractal or self-similar makes touch or WET MAKING more possible because it allows the inertia or interference of the touching wave to be non-destructive (or simply helpful). All of which is a rather crude way of saying that the principle of being feminine is inherently more touchable than maleness. This becomes rather evident when observing the more destructive nature of the archetypal male touch - witness the testasterone poison saturated 'football' game - to see the result of lack of permission to touch. 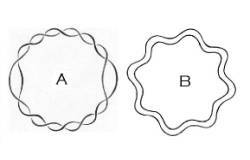 But even deeper than this - we have learned that the origin of alphabets is merely the tilt symmetry of the field effect which is donut like - codifed. 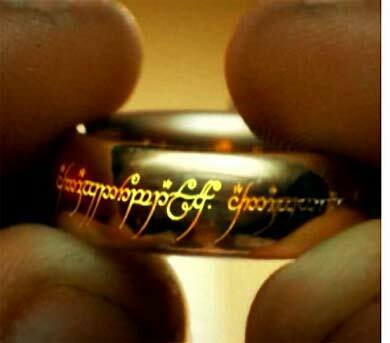 (See the physics behind 'Lord of the Ring' / donut ). Tilt the spiral vortex on the self-organizing donut torus - field effect - and the shadows are Hebrew and Arabic alphabets. ( http://spirals.eternite.com ) The principle here shows WHY the word EVE meaning the principle of making female - means BOTH - to MAKE WORD and to MAKE WET. The reason is that permission to non-destructively touch donut shaped field effect domains - is precisely what it means to MAKE A WORD. (The universe consists of everything that can be named.) This means that alphabet or word making - is literally the WETTING AGENT which allows one membrane to touch another - and not hurt either. The symmetry to permit this constructive nesting IS alphabets / and origin of symbol. (To symbolize IS to embed - see the link above). Imagine a water molecule in a cloud - that has NOT learned how to touch it's neighbor water molecules. In this predicament - the farm underneath this cloud suffers drought. If something is seeded in this cloud which re-orients that water molecule so it is better able to bond with it's neighbors - THEN A DROPLET (rain) is formed. The instruction which can tell that lonely little molecule how to touch it's neighbor - is an electrical charge field which has the SYMMETRY to provide that PERMISSION TO TOUCH. It is not that men cannot make that shape of electrical charge with enough bliss - (see physics of kundalini ) it is just that women are built for it. 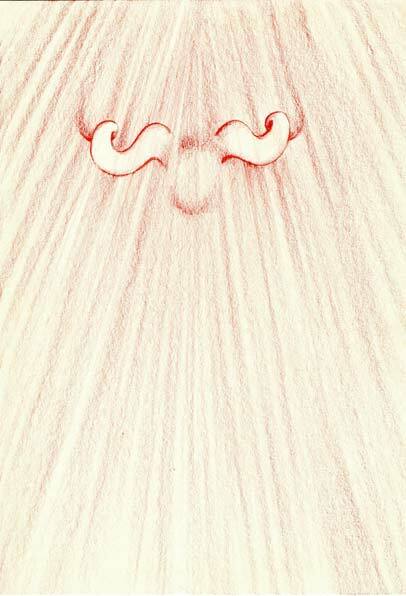 (Male kundalini requires turning inside out first - dumping the seed back up the tailbone. ) In the article here - note it was women who best restored the ground water - in the Yugoslavia post war rite. Note in the film "Mannon and the Spring" - female is most powerful in switching on - off the village source of water. Mater / Matrix / Water - refers to a principle. Holding the pattern - to make charge - touchable - is a natural way for women to be empowered. See - Science and function of bliss making.